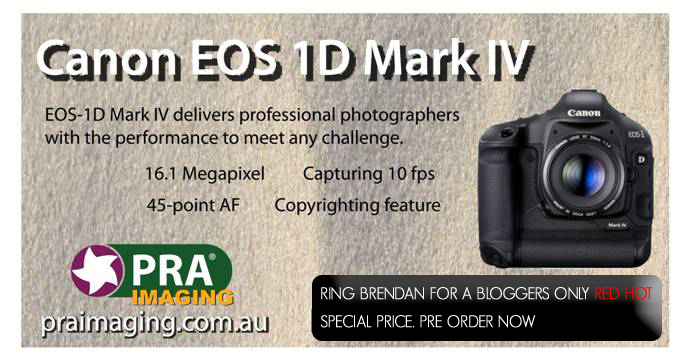 The boys at PRA have come up with a special price on the new Mark IV for all you bloggers out there. Give Brendan a call to find out the offer, it is exclusive to you, not the general public as we don’t like the general public, do we, well maybe some of them!!! ~ by christianfletcher on December 10, 2009. Hey CF, Any chance of you doing a Christmas jingle like the one Kenny D has done? Mike can shoot it. No, Christian, don’t do it, it would lower all those classy videos that have been shot by mike. shame I’m poor at the moment! maybe santa will bring me one. How about a deal on a 7D? Definately can do a 7d deal. Call us at PRA if you’re after one asap or we’ll send a deal through to CF to pass on. Paul – Im O/seas at the moment so cant call you guys – can you email me the offer? Im tempted to get it in the US, but no international warrenty, right? I’ll be in Perth this coming Friday. Ken beat me too it. Still I’m not as good a performer as he is. Plus my Xmas message would involve a harder soundtrack. Not suitable for kiddies.